West Vancouver, BC - Dylan Bednarczyk of Ontario, left, beat Benjamin Sigouin of BC, 6-2, 6-3, in the Boys' Single final at this year's event held April 2-8 at the Hollyburn Country Club. Team BC won two second place championship trophies in singles this year. Benjamin Sigouin and Rosie Johanson are our two finalists. Photo 1 (left): Top seeds Dylan Bednarczyk, left, and Katarina Kopcalic of Ontario are the winners in this year's event. Dylan enjoyed a double celebration by winning the Boys' Doubles events earlier. Dylan and his partner William Tutecky beat Benjamin Sigouin and Alexander Donski, 6-2, 6-1, in the final. Photo 2: Proud parents of Benjamin Sigouin, Ilse and Hubert. Photo 3: Cassie Chung, left, and Rosie Johanson of BC. They lost in the Girls' Doubles semis to the eventual winners, Victoria DiMuzio and Vanessa Wong, 6-4, 6-1. Photo 4: BC Boys, back row, from left to right, .Benjamin Sigouin, Neel Phaterpekar, Max Korkh, Manroop Gill, and Jack Davis. Front row, left to right, Sam Gouneili, Shant Mardikian and Isaac Davies. Team BC also included 14 girls: Rosie Johanson, Cassie Chung, Khadija Dumas Da-Silva, Nina Erdevicki, Alli Walk, Juliet Zhang, Ashley Zhu, Jessie Gong, Michelle Lim, Clara Wang, Renee Ren, Oleksandra Gorchanyuk, Mikayla Fan, and Lauren Li. Photo 5: Team BC coaches, Graeme Kassautzski, left, and Jeremy Salvo. Jeremy, the U14 provincial coach, arranged team practices every morning from 7:00 to 8:30 am - very organized and professional. Photo 6: Juliet Zhang (BC) posing with her mom. Juliet has moved to Florida to be trained in a local tennis camp. Juliet's older sister Wendy played the U18 Indoor National this week in Markham, Ontario. No. 6 seed Wendy reached the semis in the U18 event. 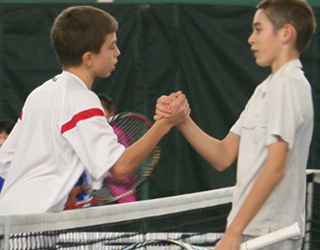 Photo 7: .Christian Lakoseljac (ON), left, and his doubles partner, Neel Phaterpekar (BC). Neel was the only unseeded player reaching the Championship Flight, where he lost to Christian in the first round, 6-1, 6-3. Photo 8: Tournament Director, Uros Budimac. Our thanks go to Uros and the Hollyburn club for running such an excellent tournament. Photo 9: Jamal Hinds and his mom, Patricia. Jamal from Alberta, at 6' 2", was the tallest player in this event. Jamal beat Zac Faveri of Ontario, 6-2, 7-6, to win Flight 4. Photo 10: Nicaise Muamba of Quebec. Nicaise came fresh from the U12 Indoor Nationals where he won the event. Nicaise reached the Flight 3 final. Girls F/5 Consolation H. Blatt (PRA) Lara Stakic (BC) 0-3 Ret.